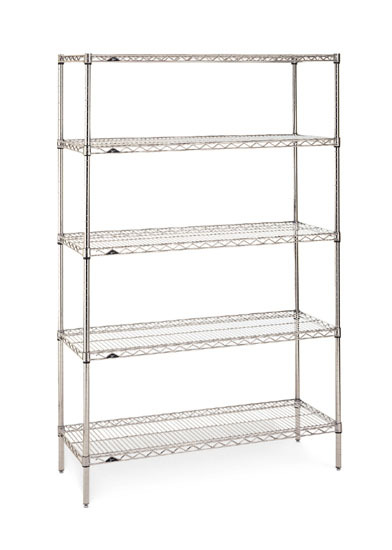 Metro wire shelving is available in several finishes including chrome wire shelving, stainless steel wire shelving and a Metroseal3 finish for freezer storage wire shelving. Choose from the durable Metro chrome wire shelving components to create a top of the line wire shelving unit or mobile wire cart that meets your specific storage requirements. The typical metro wire shelving unit consists of 4 stationary posts and at least 2 shelves. You can also use 4 mobile posts and your choice of casters to create a mobile wire cart. Select from several different posts heights and dozens of sizes of metro chrome wire shelves below. Please call 1-800-325-5522 if you need assistance choosing the right metro wire shelving for your storage application.